Knowing how to sharpen a pocket knife, fillet knife, or kitchen knife is an important skill to have at the cabin. Here are the knife-sharpening basics to get you started. People are often afraid of very sharp knives, but a dull knife is much more dangerous than a sharp one because it requires extra pressure to get the job done. This can lead to a slip, a broken knife, or the destruction of the object we are trying to cut. In the worst-case scenario, it results in a visit to the emergency room, which is the last thing we want during our vacation at the lake. Fortunately, sharpening a knife is not hard to do. We just need the right tools and a bit of practice using some time-tested techniques. 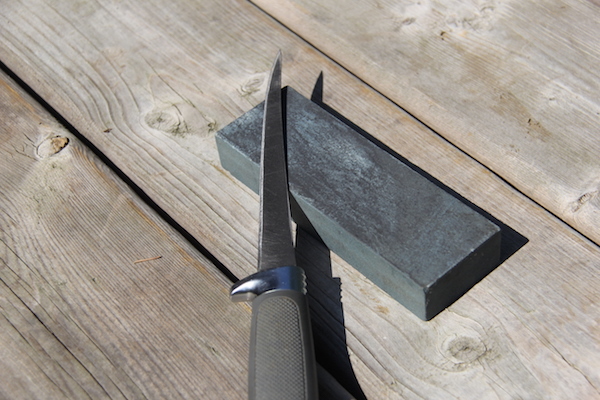 The general rule of thumb is to start with a coarse grit stone if the knife is very dull or contains nicks. You can skip this stage and move to a medium or fine grit stone if the blade simply needs a quick sharpening. Here’s a popular beginner kit that has the full range of stones included, as well as an angle guide. Here’s a higher-end kit for people who use their knives on a more frequent basis. The initial step is to take the rough parts out of the knife edge using the coarse stone and begin to return the blade to its fine “V” shape from the dull “U” shape. The process then moves to the finishing touches using the stones with a finer grit. Ideally you want to shoot for the same bevel angle as when the knife was brand new, but keeping the angle constant during the sharpening process is more important the getting the exact original angle. As a general guide, fillet knives work best around 15 degrees, kitchen knives and small pocket knives are normally 20 degrees, and hunting knives or large pocket knives usually have a bevel angle of about 25 degrees. Gentle and steady wins the race when it comes to sharpening a knife. The stone, not the force you put on the blade is the important part of the procedure. The trick to getting a sharp knife is to keep the pressure constant. Always cut into the stone rather than pull the blade back across it. In other words, make sure the edge of the blade is facing in the same direction as your stroke motion. Move the blade along the stone from the handle to the tip and always maintain contact with the stone throughout the motion. The number of strokes you use is less important than making sure you treat both sides of the blade equally. If you take five strokes on one side, be sure to repeat the number when you turn the knife over. Nicks in the blade edge can be frustrating. Try to focus on each nick individually and then proceed to sharpening the full blade. Once the the rough edges are all worked out, shift to the medium grit stone. You can start at this stage if the blade is simply dull and doesn’t require the previous heavy work to get it back in shape. Most stones can be used either dry or wet. It depends on your preference, but the general rule is to use water to moisten the stone rather than an oil-based lubricant, unless the honing lubricant is manufactured specifically for the purpose of sharpening a knife. The sharpening process is the same whether you need to bring an old rusty knife back to life of simply do a quick touch-up. At the fine sharpening stage the objective is to remove any burs that remain on the blade. A regular sheet of photocopy paper is perfect for testing the knife to see if you have succeeded in your task. If the knife slices through the page without bending it, you have done a decent job. Try to keep the blade in good condition. It is much easier, and faster, to do touch-ups every week or month, than to wait until the knife is so dull you would have more success cutting through a string with the edge of a dime. Here are a couple of popular books. The first focuses on knives while the second shows how to sharpen everything you might use at the cottage, including fish hooks, pocket knives, axes, chainsaws, and other outdoor tools.